Cup of this, dash of that, all part of morning routine. For chef Robert Lionette, food is an experience. It has a social and cultural history that goes beyond the flavors conjured up in a restaurant. It should have depth and meaning, and most of all, integrity. This can take place in a restaurant or, as on a recent Wednesday morning, at his home cooking a breakfast of oatmeal and fresh squeezed orange juice with his son, Jack, age seven. 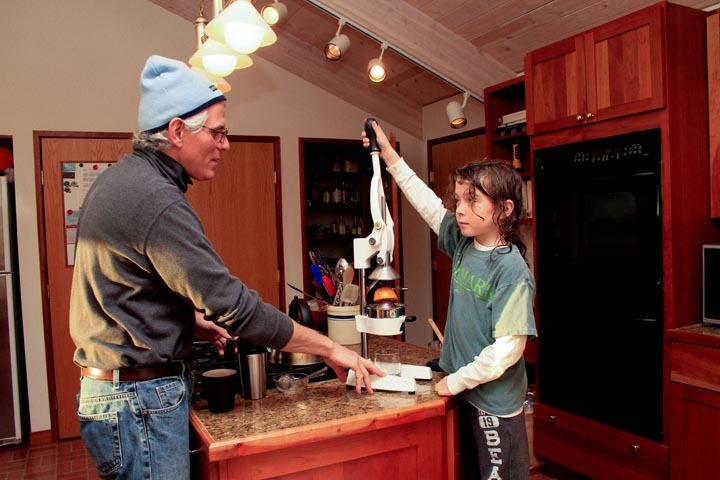 Mr. Lionette is also a frequent volunteer chef at the Chilmark School, and Jack is always an avid participant. 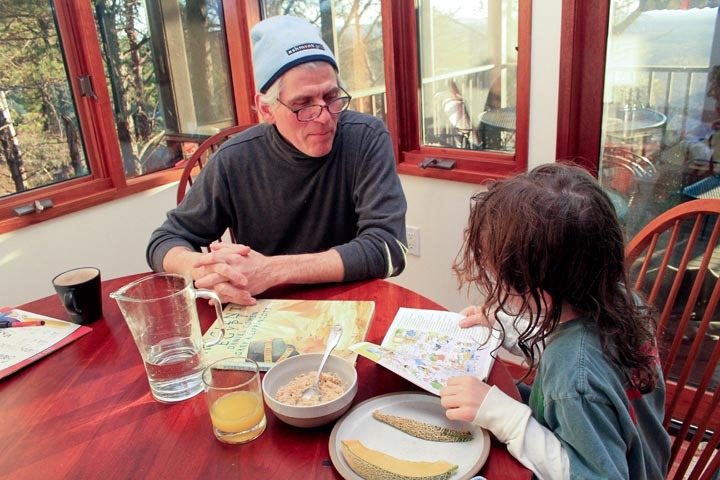 “Mealtime, at any time, I’ve come to find is so vital to family life that it’s the participation and preparation and setting of the table and the clearing of the table, the whole process,” he added. Jack clears the table every night. Mr. Lionette, 46, has been cooking on the Vineyard and in the Boston area since he was in high school. Growing up on a dairy farm in New Hampshire, food was a part of his family’s culture (“we always had an appetite”) but cooking didn’t become a big part of his life until after college. He returned home and began a culinary journey that included many top restaurants in the Boston area. “It was an opportunity to embrace my political sense, and my social and cultural interest in an area that I enjoyed,” he said. One of his earliest experiences in the kitchen was working at the Oyster Bar in Oak Bluffs under Raymond Schilcher. Mr. Lionette may have grown up on a dairy farm, but this was his first experience buying straight from a farm, in this case Allen Farm in Chilmark. Mr. Lionette took this experience back with him to Boston where from 1994 to 2008 he and his family owned the Garden of Eden, a restaurant in the South End. It was one of the first farm-to-table restaurants in the city. From a 14-seat cafe to a 120-seat restaurant, catering company, market and French bakery, the Garden of Eden thrived during a time when the phrase “farm-to-table” was still in its infancy. Within ten years of being open, all of the meats, grains, produce, seafood and artisanal products at Garden of Eden were coming from New England farms and producers. When Jack was born, Mr. Lionette went from top scale dining to newborn mentality, and the family began thinking about a move out of the city. They considered Vermont and North Hampton, but a job as head chef at Zephyrus tipped the scales toward Martha’s Vineyard. Since the move three years ago, Mr. Lionette has switched direction, working for Kitchen Porch Catering this past summer and putting a lot of time into figuring out how to accommodate the needs and palettes of his son and classmates at the Chilmark School. Next Friday he’ll help the students prepare a colonial based meal of butter poached cod, caramelized carrots and maple syrup bread pudding. The school lunch model is fundamentally dysfunctional, Mr. Lionette said, and needs reworking from the ground up. He said cooking in the kitchen with Jack has helped him see that. 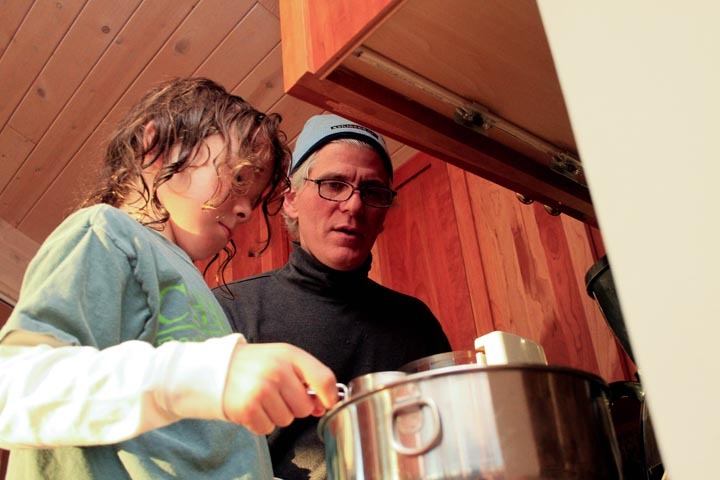 During his time on the Vineyard, Mr. Lionette has seen both extremes — cooking for small children, upscale restaurant clientele and private catering – and found that the year-round community is often forgotten when it comes to providing authentic food. Ideas and opportunities on the Vineyard are stewing on the front burner this winter, Mr. Lionette said, and he’s looking to increase his involvement in the community. “What I want out of this winter, what I need out of this winter, is to pursue my work in food and make it have a significant meaning,” he said. On Wednesday, Jan. 18, Robert Lionette will present a cooking demonstration from 11 a.m. to 1 p.m. at LeRoux at Home, located at 62 Main street in Vineyard Haven. One word, one H ... not North Hampton .. if, in fact, he means the city in western Mass.